Happy Tuesday! It’s time for my Creative Squad to share a project with you with this month’s theme: “From Small Beginnings”. Throughout the month of September, the team will be using my n*Studio Stamps to interpret the theme. The change in seasons and the childhood ritual of Back to School in September has me thinking about starting new things – new projects, learning new things, and meeting new people, and all the excitement and challenges that come with all of these “new”s. For this theme, From Small Beginnings, my Squad will think about the process of starting something new and the very first steps they took. I’ll ask them, how did you experience a Beginning? So this week we have a gorgeous scrapbook page from Marsha Valk, where she reminisces about her start in mixed media with stamping, embossing powders, and scrapbooking. This theme made me think about how I started stamping. I can’t remember which stamps I bought first. I’m guessing it was a small wood mounted alphabet set. I do know that some of the first inks I had were little Colorbox Cat’s Eyes and the first time I used embossing powder was in an Ali Edwards class. It was sooo scary and soooo amazing at the same time!!! And then, of course I had to buy the stuff for myself. I wanted to scrapbook, I wanted to heat emboss and I wanted to use materials I would (or could) have had 10 or more years ago. I started stamping on a smooth watercolour paper with embossing ink. I heat-embossed with white embossing powder. Then I played around with Ecoline and… forgot to take further photos… Oops. Once the Ecoline was dry I added the cardstock cluster and my photo. My title was made with two of my Dymo Label Makers. One of them is actually visible on the desk in the photos! I also added some Scrappers Floss to the cluster with a stapler and because I used to print most of my journaling, I adhered my text in strips to the page. I finished the page with some paint marker splatters and the date. I love how Marsha took us both back in time AND behind-the-scenes with her super fun page. And those Kaffee Klatsch and Mish Mesh stamps look amazing embossed in white against those gorgeous colors! This was a fun story of your beginnings Marsha and your project is fun too! Really awesome background with the stamps. My very first stamp was Nathalie’s Fiesta stamp and would you believe I WON it – from her???!!!! I treasure it still!!! Thanks bunches for sharing. j. Beautiful. Love the technique. Thanks for sharing. On my list to do. Great page and I like that we met through a common interest in scrapbooking. Scrapbooking has been around since the first papers were created, it might have changed and evolved over time but as long as people have memories and celebrations to document, there is sure to be scrapbooking in some form. Gorgeous scrapbook page, Nathalie!! Love what you’ve done with the stamps and the circles!! I like that Rhonda Srickland – preserving memories with art. I have been scrapbooking since the early 70’s, and even at the very beginning there was “art” on my pages. I don’t think it’s dead. it’s just transitioning like all art forms do over time. I think that scrapbooking has changed over the 13 years that I’ve been scrapping. There is more of a move towards mixed media (which can also be used on a layout for sure). I find that I am working more in my art journal but part of that is that my son is not so young anymore so I don’t feel the need to scrap every activity that we do (like I did when he was under 6). I go to a crop once a month and folks are still scrapping but maybe not buying as many supplies as they once did (since they have tons to use up first)! Oh, I LOVE it when you do a scrapping page! It is awesome!!! Your mixed media techniques make it so unique!!! Love your layout…very fun! I would like to know what companies are trying to say scrapbooking is dead. :o( It certainly is not, and I would not support any company who believes that. Scrapbooking is still about preserving memories with art. That really makes me very sad. My name is Keren Tamir and I’m 39 years old. I am a wife to a wonderful husband who is very supportive of my scrapbooking and a mother of two amazing kids; a 13 year old boy and a 7 years old girl. I’ve been scrapbooking for 11 years and I mainly scrapbook about my family. I love to create and experiment with many different mediums and techniques. My style incorporates a lot of mixed media but I love to use lots of flowers and vines in my projects. I also love using lots of different mediums on my layouts as well as stamps and stencils. My style is always evolving and that’s one of the things I love about this art. One of the main reasons I started scrapbooking was to preserve memories and photos for my children. However over the last couple of years, I’ve started to enjoy another aspect of scrapbooking. I love the artistic outlet that it gives me. I love to create and I’m passionate about what I do. The projects I’m featuring, use the fabulous stamps that my friend Nat Kalbach designed for Stampendous. These stamps are just so amazing because they create texture on my projects. I love using them to create different types of backgrounds on my designs. 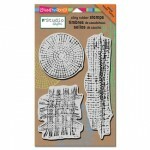 The stamps are so versatile and can be used for many different types of projects such as layouts, tags or OTP’s. You can see how I used the burlap textured stamp in some of my projects. It gives my layouts a rustic feel as if they are part of nature. Thank you Keren, I loved how you used the stamps to create this layer of natural texture and how you incorporated them into your femine grungy projects. Love them!!! I have the Mish Mesh set and I just love it. Wired is still on my wish list. Hello there! I am Riikka Kovasin. I’m a mixed media style scrapbooker from Finland. I adore getting my hands into paints and mists! To me the process of creating is equally important than the finished page. I think that scrapbooking is a form of self-expression and I’m creating pages partly because of that and partly because I want to document our lives to my two children. I was fortunate enough to meet Nathalie during an event by her and Birgit Koopsen in the Netherlands. There I got the chance to see her stencils live and bought myself one of them. I immediately fell in love with the crackle stencil and now I only regret that I didn’t get other designs, too! I’ve used the stencil in several projects already and my husband was inspired by it when he was designing his guitar. In these projects I used it to make an embossed piece of vellum. I like how versatile the pattern is and how you can create a subtle effect with it or go bold. It goes perfectly to vintage style, but can also be used in modern ones! When I first saw Nathalie’s stamp designs I knew I had to get some! They are so perfect for backgrounds and layering! They’re unique in their designs and have a lovely mixed media feeling in them. I love the circular designs and my absolute favorite is the stitched style circle. And who wouldn’t like something extra – I love the fact that all the sets include a stencil, too! I used the extra stencil in the other layout to create the background and the “Wired” stamp set in both layouts and the cards. Thank you so much Riikka, I love how you used the Crackle Stencil on the vellum and the beautiful colorful way with embossing powders you used the stencil in the Wired Stamp Set as well as the Stamps. Gorgeous! Hello, Riikka! Love what you have done in today’s post! You’ve made me decide that I must have those stencils!!!! Thanks for your inspiration! Love how Rikka used your Stencil and stamps. Love the texture and color on the vellum. Beautiful! Love seeing all the wonderful artist using your awesome stamps and stencils. It is so inspiring. Great cards and I love the LO’s too! I just used one of Nat’s stamps to do a background page in my art journal (the long one that looks like a weaving). Hi! My name is Chris Lim, a mother to three grown up boys and a grandmother to my 3 year old beautiful granddaughter. Basically, I am a scrap booker/paper crafter who loves all things beautiful. My style, to many who have known me, is more of shabby chic. Being an avid crafter, I began to explore beyond paper crafting. I now enjoy creating with different mediums and elements. As such I have gone beyond my ‘shabby chic style’. The current ‘in thing’ for me now is painting doll faces with big eyes and long lashes. I hope my work will inspire other crafters. I love Chris’ very femine and intricate style ! Love how she ties everything together and uses all kinds of different embellishments and materials on this canvas. I love the hint of grunge in the background- wonderful! Thank you so much Chris for sharing your work using my stamps with me!! and the layout is awesome too! Wow, Chris, your creations are stunning! I love that they are feminine & pretty with just a hint of grunge mixed in. Really, really fabulous! It’s a great, great artisc, fantastic projects! Gorgeous designs, Chris! I love your artistic style, using all these different mediums so well! A feast for the eyes! Beautiful work Chris. Thanks for sharing it with us. I like how you used the stamps in the background of the layout. I used the Year in Review April page as a base and toned it down here and there with Gesso. I also scribbled some marks on there. I cut out the flowers of the Mother Nature Point in Time Paper and colored three of them with watercolor. I also cut out Flowers of the Mother Nature Royale and Mother Nature Flutterby Paper as well as the beautiful butterfly. I layered different paper and vellum a the bottom of the photo. The title which is short for Kuala Lumpur where the photo was taken is hand painted with a brush and acrylic paint and then doodled on with a black journaling pen. For this layout I used the beautiful Mother Nature Cardstock and painted with some Liquitex Acrylic Paints over it. I also painted the back of some of the Damask Vellum and cut out one of the damask shapes. I layered stripes and rectangles of the Floral Vellum, Mother Nature Royale and Year in Review June Paper. I wrote the title with a Liquitex Acrylic Marker on the Mother Nature Royale paper, traced it and cut it out for a nice extra hand made touch. I splattered some Liquitex Acrylic Ink onto the layout to give it a bit contrast with black and make the colors more pop. Hope you have a gorgeous day with lot’s of chocolate …I mean…who doesn’t like chocolate? Love what you did with the scrap book papers, especially the Kuala Lumpur one – awesome colours! Awesome pages, Nat….happy to see you do scrapbook pages as well as your terrific mixed media…..great melding! What a fantastic color you decide to use! Fun layouts. Love the pops of color on the neutral background on the first L/O. You’re so talented! I really like the way that you did the title and yes, chocolates are awesome! In diesem Workshop mit Nathalie geht es um Techniken die Haptik erzeugen – spiel mit Monoprinting, Nats Stampendous Stempeln und Embossing Medien und kreiere ein kleines Buch zum Anfassen. Alle Techniken können wunderbar auf spätere Scrapbooking, Stempel und Mixed Media Projekte angewandt werden. In diesem Workshop werdet ihr eine fantasievolle Leinwand gestalten. Verwendet Farben, Stencil, Stempel, Metall und andere Objekte um Strauchwerk ein neues Gesicht zu verleihen. Hier werdet ihr mit Nathalie in eine andere Dimension eintauchen und ein kleines Artjournal beginnen. Lernt tolle Techniken mit denen man Tiefe und einfache Effekte erzeugen kann und lernt Tipps und Tricks des Artjournalings. Nathalie zeigt euch wie sie an diese Sache rangeht… Spassfaktor mit inbegriffen! Ich hoffe Ihr seid mit Andrea, Jana, Melanie und mir mit von der Partie :) Ich freue mich wie Bolle – LOL! Ich freue mich auch schon wie Bolle! Ich habe von dem Event im letzten Jahr so viel gehört, dass ich echt gespannt bin, wie es ist, life dabei zu sein! !